When it comes to making a lasting change and meeting your fitness goals, your body will be pushed to the limit. However, that isn’t the only part of your workout that will be challenged. Though fitness is about making your body stronger you are also making your mind stronger. You’ve most likely heard the above sentiment when you’ve been pushing yourself to hold plank just 10 seconds longer or when you’re deciding to do just one more burpee. But it is incredibly true. The reason why you feel like you need to quit is all part of the process that will make you stronger. As you workout, you will create micro-tears in your muscles. The burn is when these micro-tears are happening; this sensation is registered as pain in the brain. These micro-tears sound scarey to the novice athlete, but there is no need to be fearful. These are the means that our muscles become stronger. When our body repairs itself and these tears after a workout, it will make the muscle stronger than it was before. Learn to love the burn! 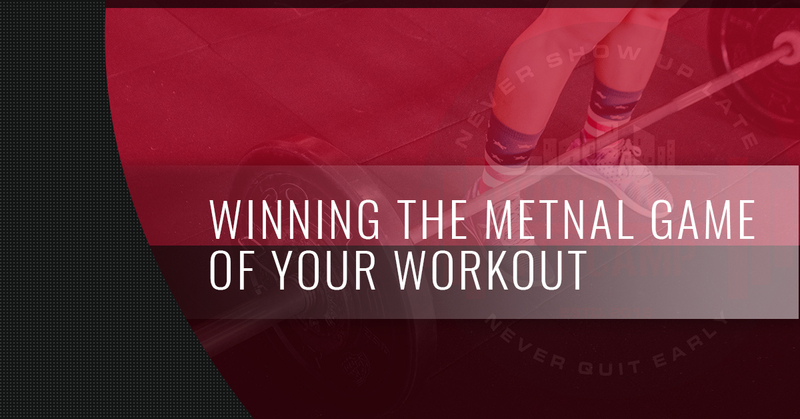 So how do you play the mental game of the workout? Today, we are going to give you a few tips to help you keep going when your mind is yelling at you to quit. As you go through your workout remind yourself of your mantra and intention. Repeat it to yourself or out loud. As you tire during your workout, you will feel more inclined to quit, but you have to stay strong and one of the best ways to do that is to remind yourself why you are at the gym. To get the most out of your mantra, tell your coach or your workout partner what your intention is for that day and have them remind you of it throughout your workout. Also, if you have a long-term mantra, consider putting it on a bracelet or on something that you have with you when you workout. Depending on how you workout, you may have little control over the playlist. However, if you are crafting a playlist for your workout or can have a say, choose the songs that will be the soundtrack for your workout carefully. Choose songs that empower you, are upbeat, and make you want to go farther and longer. What you have on your playlist may be different than what your friend has on theirs; it’s all about what makes you feel infinite and like a champion. Consider crafting different types of playlists for your various types of workouts or feelings. If your workout is a means to release anger in a healthy way, shape your playlist around that. If it is your happy place, choose songs that reflect your mood. The coaches at Downtown Fit Camp in San Bernardino would love to help you win the mental game of working out and help you reach your fitness goals. To learn more about our bootcamp classes and how they can help you reach your goals, visit our website. Try one of our bootcamp classes today!